A business consulting and technology services firm from Newark, Del. is expanding its lending and leasing software across Canada by setting up its first Canadian office in Markham, Ont. 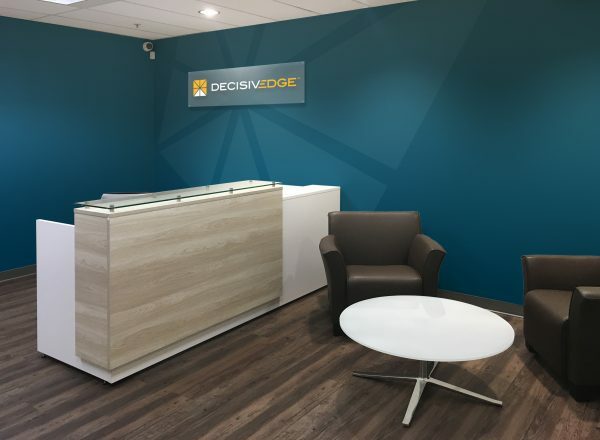 The lobby of the new DecisivEdge office in Markham, Ont. Photo courtesy DecisivEdge. MacDowell says the plan is to have the new Canadian talent bolster its U.S. business while simultaneously growing their presence in Canada. Featured prominently in the centre of the plan is DecisivEdge’s Lending and Leasing as a Service (LLaaS) powered by Oracle. The LLaaS is priced based on account volume and service levels selected by the subscriber. It launched April 2017, targeting small and medium-size lenders but powered by a world-class solution, touted DecisivEdge during its release. Its CEO, Navroze Eduljee, says aside from Oracle Consulting, DecisivEdge is the only worldwide implementation partner for the software. But they also partner with other vendors – Ramco, Qlik, Cyara, Tricentis, and Invoice Cloud – to support DecisivEdge’s advisory, custom app development, software quality assurance, and data science and analytics services. From a hosting perspective, Eduljee says everything is built on top of Microsoft Azure. It’s been a very successful couple of years for DecisivEdge, he says. “We have over doubled in size in terms of the number of consultants in the last two years,” he told CDN. The lending software market is growing too. According to Energias Market Research, the global lending software market was valued at $2.62 billion USD in 2017 and is likely to expand to $5.58 billion USD by 2024. MacDowell and Eduljee acknowledged the fact that the Markham area is rife with opportunity and talent. The search for a new office location ended quickly, says MacDowell, and construction of the new office has just been completed. “We’re going to start hiring as soon as we can,” he says, adding the company is already forming relationships with the surrounding business and technology community. One of the earliest connections made was with the Regional Municipality of York. Eduljee also pointed to DecisivEdge’s summer internship programs and the nearby tech talent in places like the University of Toronto and York University. York U is slated to open a new campus in Markham in 2021. “We’re very excited about the talent pool in the Greater Toronto Area,” says Eduljee. Markham is home to some of the most innovative office markets, according to Toronto’s bid book for Amazon’s second headquarters, with more than 10,400 companies and 400 Canadian head offices including AMD, Qualcomm, IBM, Huawei Technologies, and Aviva Insurance. MacDowell says he’s confidant DecisivEdge can grow quickly in Canada because of its ability to not only sell a solution powered by some of the most innovative technology vendors out there, but integrate and maintain it across multiple industries as well.